The problem was that although that wide-necked baggy style is tre chic right now, the simple fact is that it does not look good on me. It’s really not the most flattering unless you possess waifish qualities. And even then, well…I shall let the picture above speak for itself (tangent: and those pants. OY. Would she really go out of the house in that getup?). But I did not know this until I tried it. So the first version of this top got scrapped. Luckily it was huge and baggy so I just changed the side seams and came up with the top shown above. I’m calling it the “Angel Top” only because the sleeves look like little wings to me, not because I am ever close to anything resembling an angel. Just in case you wanted to make one too, I have created some hand-sketched instructions that are nowhere near the standard of quality you may be used to with my other patterns or tutorials. If you can manage to read my chicken scratchings or muddle your way through the drawings, you may in fact be able to create something similar to this top. It works best with stretchy knits; a serger is not necessary although if you decided to use stretch lace like I did you should finish the raw inside edges somehow (zigzag stitch would be fine). Good luck! So I think this will be my last spring top for this week…there are others, abandoned on a heap in my sewing room that will probably have to wait to see the light of blog. One needs sleeves yet and then I realized the rest of the fabric got packed into storage. Haha, oops! I’m so excited about the winners of Spring Top Week! I need to go make their crowns and put together the announcement post. Will be back soon with that. Thanks everyone for voting!!! No, listen, that's actually hilarious, because I'm on painkillers. Also the two a's in slap was not on purpose but I kindof like it so I will leave it there. So cute! And you probably would not have ended up with that shape had the original not been so loose. 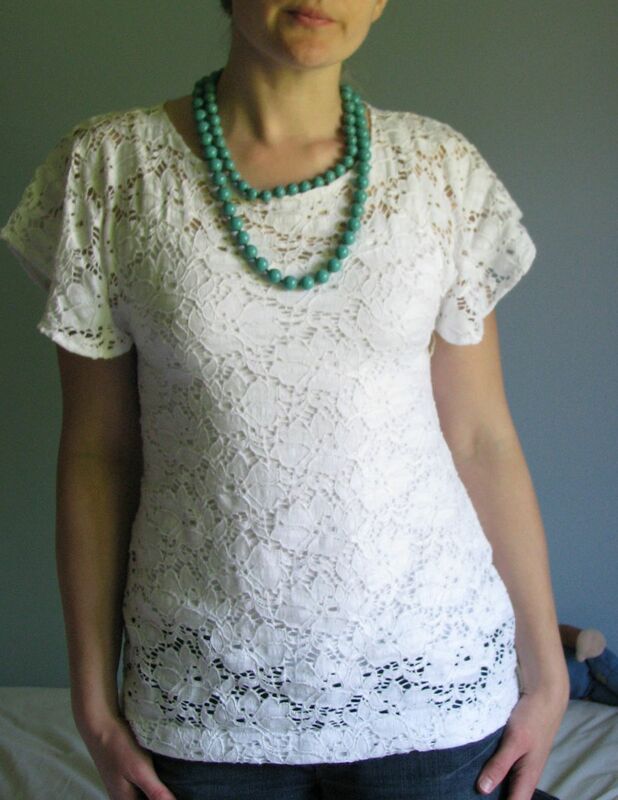 I am totally rethinking my perception of stretch lace now! I love this top! It's gorgeous! I love lace tops. It looks good on you! 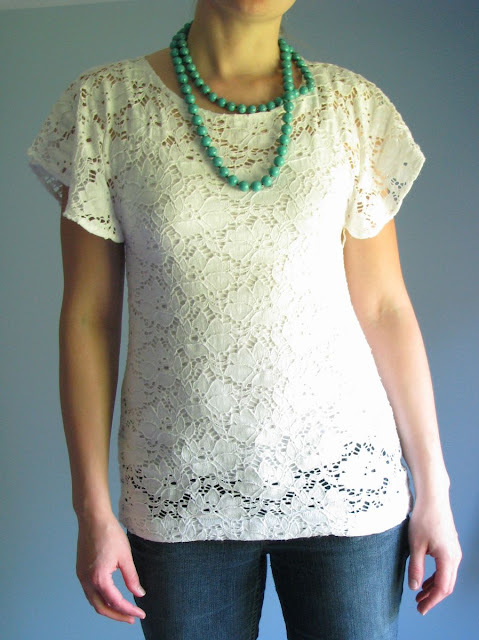 oh, i really, really, really like this top… hmmm, stretch lace? i'll have to buy some ! btw, your angel top looks FABULOUS on you ! Pretty, and so perfectly suited to you! Rae I have absolutely been loving your tops this week. They are all so simple, stylish, and stunning. It gives me hope for making normal clothes for myself! You are amazing. LOVE! This is my favorite top you've done so far! oh, and LOVE the chicken scratch pattern! can't wait to try it! LOVE this! Simple but so beautiful…could dress it up or down! Great job! Oooo I love it! Definitely on my list of things to sew this spring/summer! Thank you so much for the great instructions. I just printed them out and I actually think that I like the handwritten instructions better than the typed. You made everything very clear. Thanks so much and the top is lovely! I wonder if skinny flat-chested waifs realise how much harder it is to find flattering clothes for the rest of us? Cute Rae. And I love the combination with that necklace. This is so lovely. You really made some cool tops this week Rae! All very unique. Congrats! Oh Rae, I have been reading a loooong time now and never commented but, I can't resist because your lace top is soooooo fabulous and looks sooooo fabulous on you!!! Kudos to you!! This top really is gorgeous! Thanks for sharing it! I <3 it! I want it! I thought that your last top was my favorite, but now this one might be. 🙂 It's so beautiful! Beautiful and perfect to fit in any wardrobe! Beautiful! I completely agree that some of the most eye catching tops out there look best on waifish figures (not me!). Your interpretation is modern and classic. 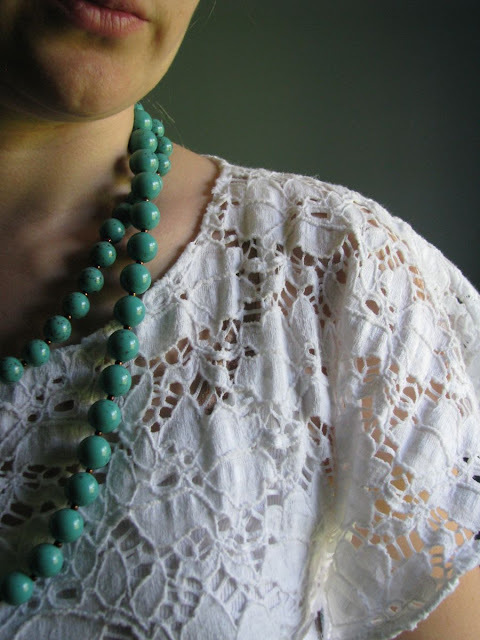 It is one of my favourites from your spring top wardrobe – I am glad you persevered! This is so pretty! 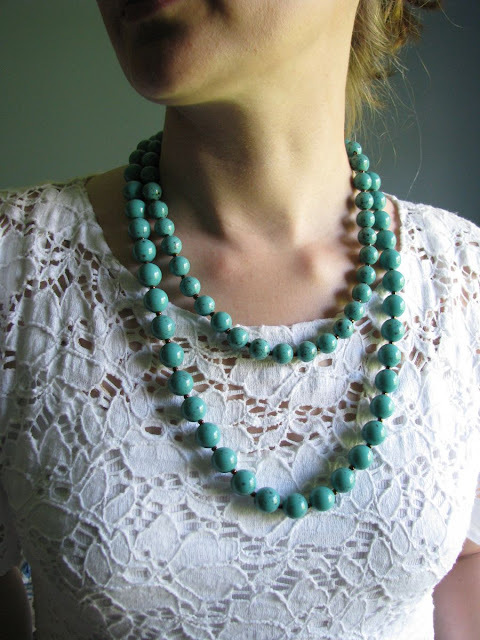 Love the turquoise beads with it! This is my favourite of the tops you posted. Very pretty! Wow this is so cute! I'm going to have to add this to my summer to-do list. This looks way cuter on you than that baggy top looked on the model – good change! Love it! I had the exact same thought about that anthro outfit when I looked at it the other day. Wow, oh so nice, I want it. Then, hang on, I would look hideous in that! However, I'll be making your version tomorrow, a lot more flattering! Thanks so much. I love this! I'm going to see if I can draft it to fit my 4 yr. old granddaughter. Thanks! Your tops are lovely – and inspiring. But, I assume that you are wearing some type of camisole under your stretch lace top? Oh Rae, this is beautiful! Where did you get your lace from? This top is truly lovely. I love it! Nice job. I agree with you about the loose shaped top of the first one not looking good on nearly anyone. Thanks for saying that — good to know it's not just me! Only worry I have is stretch lace — never worked with it. Gonna try, now, though. Thanks. Your top is way better. I love the sleeves! And those pants in the Anthropologie photo..my first thought was "the eighties called, they want their pants back." Oy is right! I love this top Rae and the instructions are just perfect Thanks! If you had entered this top I would have voted for you!! love the necklace.. can that be bought somewhere in the cyber universe? or did you make that too?! 🙂 love following your blog.. and dreaming of being able to replicate your creations. I actually like this shirt best of all the ones you made and posted this past week. I think it is very flattering on you! I love how yours turned out! i often wonder about those magazine pictures, too. I have never seen any super fasionable people on the street wearing these things! Great job, I'm very impressed with your version. You are an angel. And this top is truly heavenly. I'm totally making one. So cute on you, and I like the hand sketched pattern! Yes please, where did you get stretch lace?? I can't find any anywhere. Love this one. Thank you for sharing. I just found your blog and I'm so excited to sew some things for my 3 grandgirls!! Thank you, thank you! Wait a sec? Fields?? Rae – do you live in MI? Love the top! And, your directions and diagrams are perfect. Sometimes tutorials are made too complicated, yours is perfection. This is definitely one of my favorites, nice job! So about 1 or 2 yards of the stretch lace for this pattern? And just a camisole underneath? I am very new to garment sewing and just wanted to be sure as I think this top has to go on my project list. I just made my first garment ever with your spring ruffle tutorial and love it, thank you! storyofkat: yes, I think I bought 1.75 yards and that was plenty. It doesn't quite work for me with 1 yard because the width of 44" fabric is a little too narrow to make those nice "wings" so I cut the pieces sideways (normally the vertical dimension of a top pattern would run parallel to the selvage). But if you had 54" fabric you could probably get by with just 1 yard! everyone else: Thanks for the lovely comments!!! oh also: yes, I wear a tank top underneath because it is really pretty sheer. Also sometimes a plain white tee-shirt with cap sleeves. Both work fine! Thanks for sharing the instructions for the angel top. Just made one last night and it turned out great. Your guide was very easy to understand. So somehow I've been living under a rock and keep forgetting to follow your blog every time I see your name somewhere in blog land. I'm so glad I finally did! Your blog is incredible-you're so talented. This shirt is fantastic. I've been looking for something like it. Really pretty. I really LOVE LOVE LOVE that lace!! I looked at Field's Fabrics online, but that stretch lace wasn't available. If you, or anyone else finds that stretch lace, or something very similar, please let me know where you found it. Jeniferward@gmail.com. Thanks!! I love this style of sleeve and your top looks gorgeous! The tutorial seems pretty straightforward. I may have to make one some time. Thank you. I have had a great time reading your blog today. I wanted to especially thank you for the Angel Top pattern. I design knits and happily handwrite patterns to share. It is the typing them in someone else’s format that stops me. You have shown me that I can use my paper and pens and just do it my way. Very freeing. Thank you again. love this top! it is amazing! i clicked on the instructions link and it said the file was damaged? i’m hoping to get the instructions and see if i can figure out how to make this! can’t wait!! thanks so much! Hrrm, ok will put that on the to-do list. Thanks for letting me know! Just found this tutorial yesterday. I love the lace that you used. I cut mine out today and made it. The shirt is simple (which I love) and oh so flattering. Thank you so much for posting this tutorial!!! I love the design. But more importantly I love the part where you say that even though the loose top is what’s in right now, you’re dressing for your body type. I think all women should understand that. I can’t thank you enough for doing this!! I bought some stretchy lace forever ago and haven’t had the guts to go for it because I wasn’t sold on a specific one. YAY now I can do this. I love it! Am I the only one having trouble opening the pdf file? I just wanted to let you know, that I featured your great shirt in my blog. Have a great day, Fee! Thank you for the instructions. 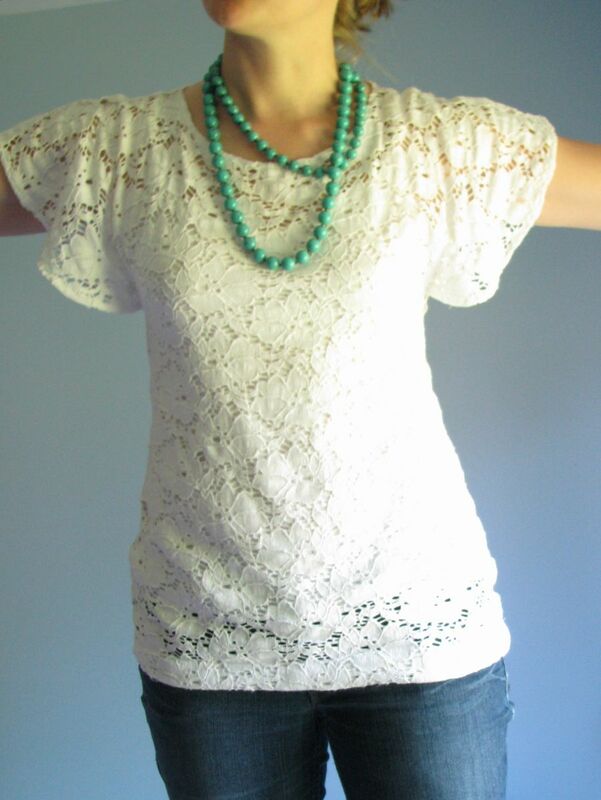 This is what I was looking for-a simple top with flutter sleeves. I love Fields! I had no idea you live in MI! I live in the GR area! small world! I just stumbled across this on Pinterest, and I love this top. Where did you purchase your lace for it? Or if you can recommend a site that might have similar lace that would be awesome! This stretch lace was purchased at Field’s in West Michigan — I’ve been back since then and haven’t seen it, but maybe Harts online? Love the top – especially the angel sleeves! I love it! And it looks really cool with the jeans and green necklace!!! I haven’t tried sewing with stretchy fabrics yet (let alone lace) but this makes me want to try!! This top is sooo adorable! I was really wanting to make it, but the link to the instructions says it can’t be found? Hope this helps future searchers and many thanks to Rae for designing and offering such a lovely and easy pattern.